(described by van Tieghem in 1876) Berkhout, 1923 nom. cons. Bipolaris is a dematiaceous, filamentous fungus. It is cosmopolitan in nature and is isolated from plant debris and soil. The pathogenic species have known teleomorphic states in the genus Cochliobolus and produce ascospores. The genus Bipolaris contains several species. Among these, three well-known pathogenic species are Bipolaris spicifera, Bipolaris australiensis, and Bipolaris hawaiiensis. See the summary of synonyms and teleomorph-anamorph relations for the Bipolaris spp. Bipolaris is one of the causative agents of Cochliobolus The clinical spectrum is diverse, including allergic and chronic invasive sinusitis, keratitis, endophthalmitis, endocarditis, endarteritis, osteomyelitis, meningoencephalitis, peritonitis, otitis media (in agricultural field workers),and fungemia as well as cutaneous and pulmonary infections and allergic bronchopulmonary disease. Bipolaris can infect both immunocompetent and immunocompromised host [1461, 1475, 1487, 1495, 1586, 1680, 1739, 1799, 1847, 1873, 1936, 1956, 2042, 2177, 2182, 2297, 2345, 2359]. As well as being isolated as saprophytes on plants, Bipolaris may be pathogenic to certain plant species, particularly to Graminiae and also to animals, such as the dog . It may cause nasal mycotic granuloma in the cattle . Bipolaris may also be isolated as a laboratory contaminant. The hyphae are septate and brown. Conidiophores (4.5-6 µm wide) are brown, simple or branched, geniculate and sympodial, bending at the points where each conidium arises from. This property leads to the zigzag appearance of the conidiophore. The conidia, which are also called poroconidia, are 3- to 6-celled, fusoid to cylindrical in shape, light to dark brown in color and have sympodial geniculate growth pattern. The poroconidium (30-35 µm x 11-13.5 µm) is distoseptate and has a scarcely protuberant, darkly pigmented hilum. This basal scar indicates the point of attachment to the conidiophore. From the terminal cell of the conidium, germ tubes may develop and elongate in the direction of longitudinal axis of the conidium [462, 1295, 1495, 1548, 2144]. Teleomorph production of Bipolaris is heterothallic. The perithecium is black in color, and round to ellipsoidal in shape. 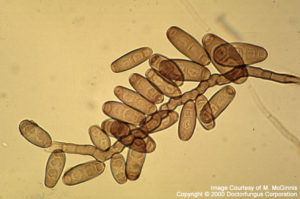 The ascospores are flagelliform or filiform, hyaline in nature and are found in clavate-shaped or cylindrical asci. Each ascus contains eight ascospores. Phaeoid hyphae (diameter: 2-6 µm) with frequent septations are observed. The hyphae may be branched or constricted at points of septations . In vitro susceptibility testing procedures have not been standardized for dematiaceous fungi yet. Very limited data are available on susceptibility of Bipolaris. These data suggest that itraconazole MICs are variable and voriconazole MICs are considerably low . Amphotericin B and ketoconazole are used in treatment of Bipolaris infections. Surgical debridement may be indicated in some cases, such as sinusitis .